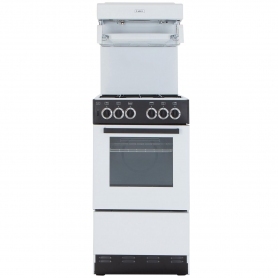 If your kitchen is a little tight on space, the FS50GTCL Belling cooker is the perfect solution. Measuring 50 cm in width, this white twin cavity model fits neatly into smaller spaces without compromising on cooking performance. This appliance also has adjustable feet, so you can align it with your kitchen’s worktops for a more streamlined appearance. The FS50GTCL is ideal for smaller kitchens as it’s narrower than most normal cookers, giving you extra surface space. This freestanding Belling cooker also comes with a glass lid, which can be lowered when the hob’s not in use, giving you even more room to prepare meals. When the lid is up, it acts as a natural splashback during your cooking extravaganzas. As the Belling FS50GTCL is a twin cavity model, it offers lots of flexibility – this lets you cook meals in the main oven while using the separate grill at the same time. With a roomy 62 litre capacity (gross) and two shelves in the traditional main oven, you can cook plenty of delicious food, whether that’s the Sunday roast or the pudding to go afterwards. The cooker has also been rated an ‘A’ for energy, which helps to keep running costs down and limits its impact on the environment. In the top cavity, you can grill sausages and burgers to your heart’s content. Designed for open door use, the top cavity offers true variable grilling, rather than baking that occurs with closed door grilling. If you want to get started straightaway, the grill even comes with its own pan and trivet. Both cavities have easy clean interiors with enamel linings – just give them a good wipe down after use to keep the FS50GTCL spotless. And, the inner glass doors are removable for easy access and cleaning. On this Belling cooker, you’ll also find a hob with four gas burners, so you can have multiple pots and pans on the go at once. 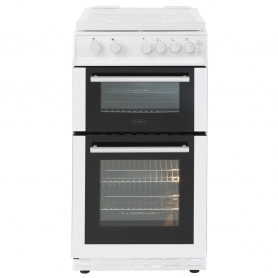 It’s ideal if you’re looking for a traditional style, as it has a push button ignition and gloss enamel supports. Many of us love cooking with gas, and it’s easy to see why. Firstly, the flames on the hob allow for precise, rapid heating so you can whip up perfect meals every time. And, inside this model’s main oven, you’ll get a moister heat than you find in electric models, which is perfect for baking delicious cakes and pies. The FS50GTCL is also fitted with a flame failure device (FFD). This shuts off the gas supply should any flames go out, preventing a build-up of gas in your kitchen. The glass lid also shuts off the gas supply when it’s lowered past a certain point, helping prevent further accidents. 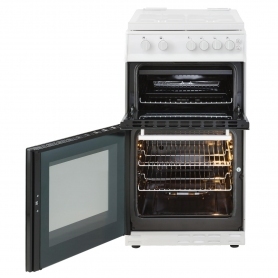 This Belling cooker has glass doors, so you can see inside easily without opening them. The main cavity also has a handy interior light so you can monitor your food while it’s cooking to achieve taste precision. Both of these doors are double glazed to improve insulation and prevent heat from escaping. This helps the appliance to be more energy efficient, and keeps the door’s exterior cooler to touch. 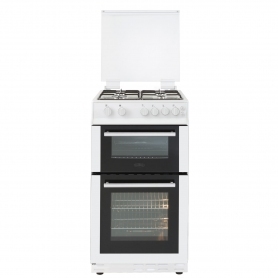 If you’re after a narrow gas cooker with a great range of cooking features, take a look at the FS50GTCL from Belling. Order yours today.